The Virginia Department of Agriculture and Consumer Services (VDACS) administers a variety of Virginia laws and regulations that protect the environment, as well as agricultural and horticultural interests, from pests and diseases. In the VDACS Office of Commodity Services, the agency provides grading and inspection programs for fruits and vegetables, peanuts and grain to identify product quality and condition. 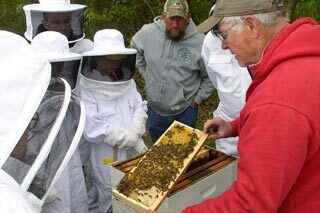 Administers the state’s apiary inspection program and resources for Virginia beekeepers. Protection for Virginia’s threatened and endangered species. Ensures the integrity of regulated commodities such as feed, seed, fertilizer and lime. Grading and inspection program in the Office of Commodity Services. Research program for public institutions of higher education. Protects Virginia’s agricultural and horticultural economic interests. Voluntary, proactive approach to further mitigate the risk of pesticides.